MailScan Administration Console can be accessed using a browser, thus enabling Remote Administration of the application. 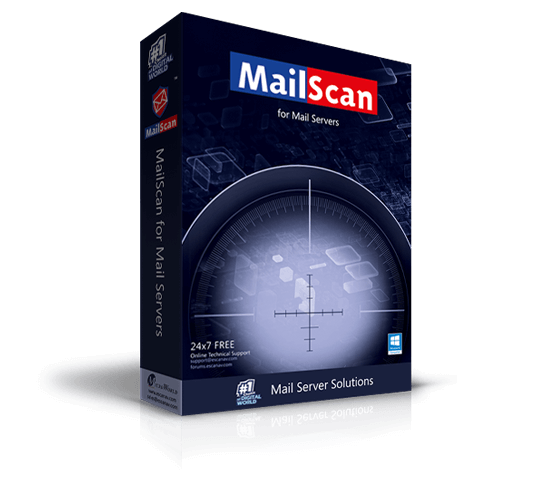 MailScans scans emails for all types of Viruses, Trojans, Adware and other evolving cyber threats in real-time. It even scans for all inbound and outbound Mail Traffic. MailScan facilitates blocking of certain attachments having file extensions such as EXE, COM, CHM or BAT from being sent or received. MailScan stops spamming and phishing using a combination of technologies such as Real-time Black List (RBL), SURBL, MX/A DNS Record Verification, Reverse DNS, X-Spam Rules Check, Sender Policy Framework and Non Intrusive Learning Patterns. Mails from unknown senders are rejected temporarily, as most spamming servers do not try to send the same mail, in case of a first time rejection. In case the mail is legitimate, the originating server re-attempts to send the mail, which is then accepted. This module helps stops spammers from using your organization's IP addresses to send spam. MailScan facilitates options that can be customized to archive e-mails and attachments flowing in and out of the system. This feature also helps in comprehensive content auditing. In case of Virus Outbreak, an alert is sent to the administrator providing a detailed report of virus emails received within a defined span of time. Provides an option for Mail Parking.